Officers from Lisburn District Support Team have arrested a man aged 26 on suspicion of possession of a class A drug and possession of a class A drug with intent to supply after stopping a car at Nutts Corner Road on Thursday January 7. A Lisburn police Inspector explained that a quantity of drugs was discovered following a search of the car at Nutts Corner Road. 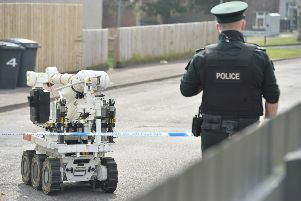 He also said that another quantity of suspected drugs was discovered during a follow up search at a property in Lisburn. Inspector Robinson continued by saying that the police in Lisburn remained committed to tackling the issue of drugs in the city. “Amphetamine is a very dangerous illegal drug and we have a duty to protect the public and to keep people safe. “We want to send a very clear message to those involved in supplying any form of controlled drugs, that if detected, they can expect to be brought before the courts. Information can also pass information to the police in Lisburn anonymously by contacting the independent charity Crimestoppers on 0800 555 111.